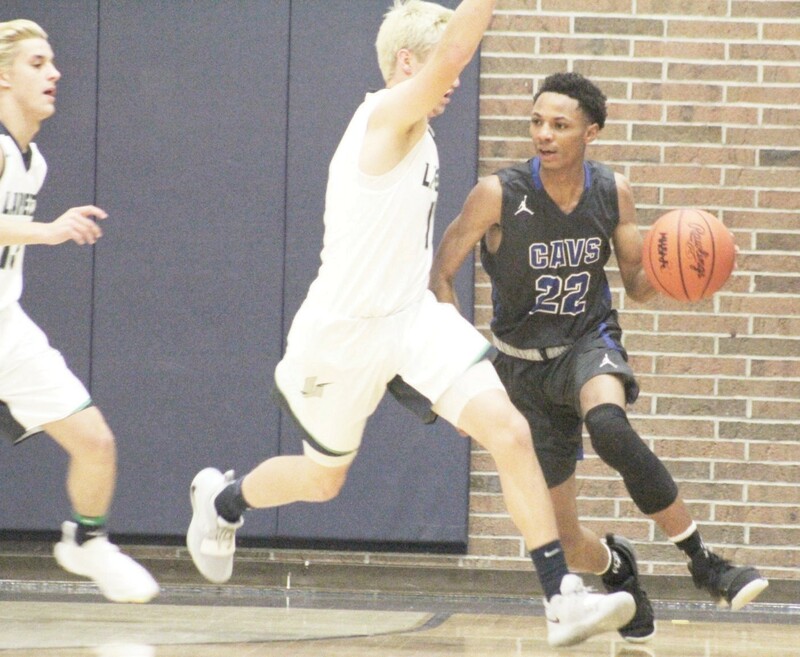 LAPEER – The Carman-Ainsworth basketball team narrowly escaped Lapeer 55-50 in Tuesday’s Saginaw Valley League opener. The Lightning cut the lead to within two points with less than a minute to play, but a pair of free-throws by Jayden Nunn iced the game, keeping the Cavaliers undefeated on the young season. “We knew they had some shooters coming back from last year,” said Cavs’ coach Jay Witham after the game. “We knew they lost Knickerbocker, but still had some guys that could fill it up. They ran their sets very well. They’re very wellcoached. Carman-Ainsworth jumped out to a 4-0 lead after Donnal Conway and Nunn opened the first quarter with a pair of lay-ups. The Cavaliers took a 13-11 lead off a Michael Fletcher put back with 30 seconds left in the quarter. Carson Butterfield missed a three-point heave with the clock running down for Lapeer, but teammate Brian Brown caught the air ball and finished with a reverse layup as the buzzer sounded, tying the game at 13-13. The second quarter mirrored its pre- decessor, as both teams traded buckets. Tied at 26-26 with under a minute left in the half, Conway stole the ball and went the other way before he was fouled in transition. Being in the bonus, he split the free throws. On the next possession, Nunn swiped the ball back before finding Conway streaking down the court for a layup. Patrick Hollis then blocked Alex Huestis’ three-point attempt as the buzzer sounded, preserving the Cavs’ 29-26 lead heading into the half. In the third quarter, Carman-Ainsworth built its lead to 11 points on two different occasions, but the Lightning kept battling back. At the 3:34 mark, Isaiah Jones split a pair of free-throws, extending the Cavs’ lead to 42-31. Lapeer’s Ian McAllister answered with a three-pointer. After forcing a turnover, Carson Currie’s put-back cut the lead to 42-36, a score that would remain intact heading into the final frame. Butterfield scored two-straight buckets, and Currie then split a pair of free-throws, pulling Lapeer within 47-44 with 4:36 remaining. The Cavaliers were able to extend the lead to 52-46 with a 1:30 left in the ballgame, but the Lightning were never able to get over the hump before Nunn sealed the deal. Nunn finished with a team-high 15 points. Michael Fletcher added 10, and Conway finished with nine. Jones chipped in with eight points, while Dustin Fletcher scored six. Mehki Ellison had four, and Dukarri Williams had three. On Saturday, Carman-Ainsworth defeated Cass Tech 60-58 on the road. Nunn led the Cavs with 19 points, and Michael Fletcher scored 18. Jones added eight points, while Ellison scored five. The Cavaliers, 3-0, are off until next Tuesday when they travel to Davison, 2-1.